Temperatures are plummeting in southeastern Australia today as a strong cold front brings a wintry mix of weather. Image: A visible satellite image combined with modelled air temperature, showing today's cool change hitting southeastern Australia. The warmest January on record in Tasmania and Victoria almost seems like a distant memory today as cold Southern Ocean air spreads over the two states. After reaching a top of 21.5 degrees at 10:39am, the temperature in Melbourne had dropped to 14 degrees by 11am. By midday, the city had cooled to 12.7 degrees, although wind chill was making it feel more like 10 degrees at the time. Hobart isn't faring much better today, sitting on 15 degrees at midday but feeling more like eight degrees in the wind. Tasmania's Mount Read had cooled to just 0.5 degrees shortly before 2pm and was recording precipitation. This is likely to have been falling as snow. As temperatures drop further tonight, snow could fall down to 800 metres above sea level in southern and western parts of the state. 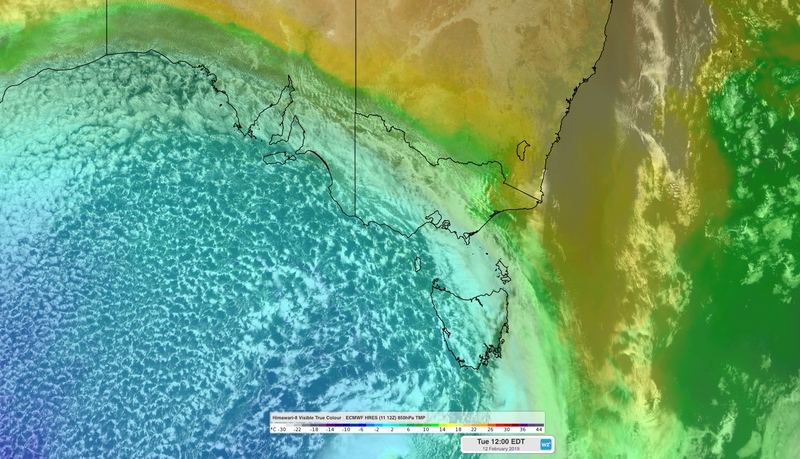 The surge of cold air in southeastern Australia is pushing a mass of warm air into NSW ahead of the approaching front. At 1pm EDT, Sydney was sitting on 35 degrees, which was 20 degrees warmer than Melbourne at the same time. The NSW Rural Fire Service has declared a total fire ban across the state due to today's hot, dry and windy weather.